September 30, 2009. 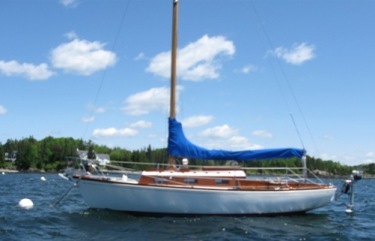 We found out about Chandra first with a phone call from Paul Trockle, the owner of Yankee #, 174 Kaela, in Twisp, Washington, and also of Charisma, another Yankee on the hard near Lake Champlain in Vermont. We'll hear more about Paul and his Dolphin 24 fleet in coming days and weeks. Paul sold Chandra to Tom Moore some 10 years ago, and called Tom to tell him about our conversation. Tom responded with the following email. My name is Tom Cooper and I own #74. She is currently in a shed, where she has been for 10 years, on Bainbridge Is. WA. I purchased her from Paul Trockel, who today called me out of the blue to chat about the boat and he gave me your name and the web site. I am in the boat business (a Pacific Seacraft dealer). I really liked the lines of the boat and thought it would be a fun boat to have and sail without a lot of $$ invested. But a shaft coupling problem prevented me from sailing. To get to the coupling I had to cut out the cockpit sole and remove the fuel tank. Then the project got put on hold etc., etc., and now it is 10 years later. My wife wishes I would sell her, but I won’t because some day she will be restored. So one of these days……. I enjoyed seeing your website and when I get photos that are worthy of sharing – I will send them to you. 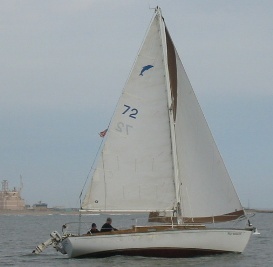 Chandra is one of the 4 boats that John Shumaker, founder of Yankee Yachts, built on bare fiberglass hulls supplied by O'Day and finished them as wood boats to the plans of the Mermaid 24 (a wood Dolphin). 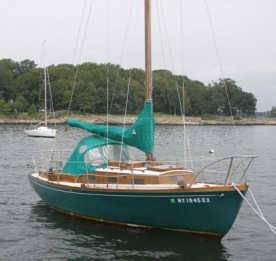 These boats were the inspiration and genisis of Yankee's reputation for building quality small yachts with superior wood detail. So far we have 'found" hull #71, #72 and now #74. We are still looking for #73 Webmaster Note, April 3, 2016 - we found her, Mike Horn's Avellar, #73, and are just getting around to updating this page.... Until Tom can send us pictures of Chandra these pictures of her sisters - Charlie Drew's Arion, # 71 and Yankee's 1st boat, and Gian Bowles' Quest, #72 will have to suffice.